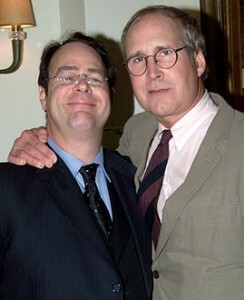 Dan Aykroyd and Chevy Chase Are Working On A Comedy?!?!? Dan Aykroyd took to his Facebook page today and said, “Chevy (Chase) and I are about to start work on a script concept for a comedy movie. Cannot say too much about the concept, but the joy of working with him again is one that I am extremely excited about. Chevy is one of my favourite people, and one of the great anarchistic and physically committed comedians in the business.” Could this be a new epic comedy from two of the funniest people around? The two have not worked together since the 90’s comedy horror film ‘Nothing But Trouble’. Obviously the two have much respect for each other and since the Ghostbusters 3 film is in an indefinite hold, Aykroyd has time to pursue other projects. Chase has been recently seen on ‘Community’ which is extremely funny and Aykroyd hasn’t been doing much of anything lately. So let’s hope for the best and see this potential comedy project come to fruition with either John Landis directing or Apatow directing. Also, I wonder if Chase can get Aykroyd a guest spot on ‘Community’? How epic would that be? Check out the Trailer for ‘The Campiagn’, Starring Will Ferrell and Zack Galifianakis!!! This entry was posted on Tuesday, March 20th, 2012 at 4:12 pm	and is filed under Film, News. You can follow any responses to this entry through the RSS 2.0 feed. You can skip to the end and leave a response. Pinging is currently not allowed. « AMC Theaters Presents ‘The Ultimate Marvel Marathon’!! !